We've all got friends in our lives that are nice people, but they always seem to be broke. They don't have a dime to their name, and if you ask them why, they don't have a clue. It never seems that they can figure out why they're short on cash. Today I want to look at a few reasons why broke people are broke, and why they'll most likely continue that way (unless they make some major changes). 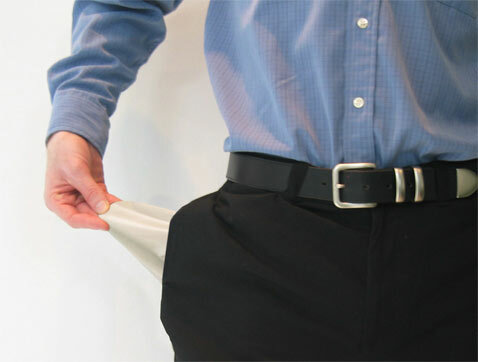 Here are a few of the reasons why people find themselves without money. Their problems are never their fault: Broke people don't like to take responsibility for their problems, they will often shift blame and say it's someone else's fault. They blame their friends, family and the government. They believe the old saying, “the little guy just can’t get ahead“. What's a budget? : A lot of people who are broke find themselves that way because they have no idea where their money is going. They've never done a budget. Their money quickly disappears every month into an endless black hole of large and small expenses. They don’t plan for the future. Today is all that matters: Money doesn't stick around for future uses because it is all spent today. Saving and planning for the future are foreign concepts. Money gets spent on things that aren't needed: We've all got those friends who just can't help themselves – they already have a couch, but they find a design they like better and buy it – even though they can't afford it. They have a phone, but decide to buy the newest greatest Iphone. Keeping up with the neighbors: Far too often people will buy a house in a neighborhood they can't afford, and then they end up spending even more money on the other lifestyle accessories to keep up with the Joneses. They end up buying a nicer car, a boat, expensive landscaping, etc. One bad spending decision begets another. You paid what? : Broke people far too often don't know how to find a good deal and even more often don't negotiate to get a better deal. Why pay more than you have to? Credit is their best friend: They don't practice delayed gratification, and they would never save for something they want. Just put it on the credit card until it's maxed! We'll figure out how to pay it some other time! They rely on others to get them out of trouble : We’ve probably all know someone who always ends up going to their parents, family or friends to help them pay for one of their debts. They get in debt up to their ears, and then when they can't pay for it, it's back to mommy and daddy's house to beg for money. Why budget for the future when I can have fun today: They don't like to plan ahead for tomorrow because it seems so far away. Instead, let's eat drink and be merry today! They are all about appearances: Broke people often are broke because they would rather have others think they are doing well, or are wealthy, than actually do the hard work of actually finding a way to be wealthy. The result? They spend a bunch of money on things they don't need in order to appear like they've got power and influence. Obviously this list of things that broke people do isn't exhaustive, but it is more of a way to get people thinking about how and why they're making the decisions about their money that they are. If you can catch nip some of these behaviors in the bud, you'll be much better off for it. Have you ever engaged in any of these behaviors? Do you have a broke friend or family member that just can't seem to get out of a hole? Tell us about it in the comments! The “Keeping up with the Joneses” mentality drives me nuts. We’re relatively-young newlyweds in the first year of our mortgage, so there’s no way we’re going to “compete” with our neighbors — and that’s all right with me. Let ’em laugh at my 6-year-old car in my driveway (that’s been paid off for 2 1/2 years). Our property is neat and clean, and that’s all that matters to me. Buying a couch without a solid plan on how to pay for it silly enough, but having children (on purpose) with no job or plan on raising them and paying for them, drives me crazy. I agree people never want to see to take responsibility for any of their actions. They spend impulsively, then when the creditors call they wonder what they did to deserve it. I’ve always been happy living the simple life. My parents wanted to raise my brother and I in an environment where we would think we didn’t have a lot of money. We always cut coupons and bargain shopped for clothes. However, in times of emergency, my parents always had cash on hand and never had to use credit. Even when my dad lost his job, my parents had saved up enough money to support us for awhile. My parents are a prime example of how it can be done.. and they taught my brother and I very well. They stressed the importance of education, and I went to community college. I went to a state school for my bachelor’s and had NO student loan debt (and I didn’t even use financial aid). My brother and I both have excellent credit and I’ve already started saving money for my future. Great job! We need more people like you to get this country back on track! I think another large one is looking to material things to bring fulfillment. We buy things – not because there is an immediate need – but because we think they will add something to our lives. Also, many people will buy a house, because “that’s what adults are supposed to do”, or “it’s the next step for us”. But that doesn’t make any sense! Again, they don’t take an assessment of their lives and determine what is really a need versus a want – they just buy and chase this “American Dream” that doesn’t exist! I think the credit trap is possibly the biggest reason here!!! I remember being given a small overdraft, so I went to the end of that….. They the bank increased it…. i went further in…. My poor mindset kept believing I would pay it off next month! Luckily I am better now! I think that these are great reasons, but I think that you’re missing the number one culprit. “Their parents didn’t teach them.” Most people learn to budget, to take personal responsibility for their finances, to distinguish between wants vs. needs or not, at an early age from their parents. Unfortunately, most parents are uncomfortable with their own finances and are failing to teach their students critical financial-life skills. I’m actually building software that leverages parental involvement and social gaming to teach kids both solid personal finance skills and personal responsibility. I’d love to share more about what we’re doing if you are interested. “You’ll never get wealthy working for someone else”. I’ve owned 4 businesses in my life, and while some did well, some did not. But I definitely learned from those experiences. But the one I think I learned the best, is to leverage your time. Last year, I had a real estate sales business, and was working 70-80 hours a week, and very rarely took a full day off. Then a friend showed me a business plan that blew me away. I gradually slowed my real estate work weeks, and grew my telecommunications work weeks. And after 9 months, I closed my real estate business for good. I no longer had to sell 2 or 3 houses a month to pay my bills. Because the things to sell are services that people use every day. Cell Phones, Internet, TV, people are never going to go without those. Best of all, my business brings it a small portion of those bills. There is a better way than 40 hours a week. I’m proof of that. It took some hard work, but when EVERYONE uses the product you offer, it’s easy to find customers. If you’d like more information, feel free to email me. GREAT-Each point was true. The inability to delay gratification can hurt not only one’s budget, but one’s relationships and waistline! I think I did each and every one of those. Including #11, like a poster above said, I used material items to fullfill something else missling in my life. I hit rock bottom and now I’m digging my way out of all this debt. I still have lots of debt and no savings but I feel “cured” of the debt disease. I’m working hard to end the cycle with my children as well. Here’s a post on emergency funds for you. As far as planning ahead for things you want, I’d just suggest first figuring out if you really need it, and then if you do, add a line item to your budget for that thing. Of course i’d put other things first like all the necessities, and saving for retirement. I worked for over thirty years with people applying for, and on, a popular kind of federal welfare, so I have great experience with broke people. I’d like to add one “broke rule” I often observed: When you get a check, spend it ALL. Now, when it comes to tiny welfare checks, bleeding hearts will claim it’s cruel to expect people to spend any less than the full amount of the check. That did make sense for the $70 per month General Relief checks the state of Missouri used to pay, but what many people don’t realize is that many poor people have had money. I sometimes saw people get insurance settlements or other lump sums of $50,000 or $100,000 — and they still spend it ALL. I once saw a young man who’d been injured as a child turn 18, receive a trust fund of nearly $200,000 established by a court order — and give it all away to his relatives. Then was upset when I stopped the government check he felt entitled to. As Andrew Tobias says, no matter how much or how little your income is, there’s somebody somewhere who’s getting by on less. Live like them, and you too can save some money. If I had to add an 11th one, then I would say it would be “They are lazy”. Not only are they broke because of how they spend their money in 1-10, but they sometimes aren’t motivated to earn the money in the first place. It’s all about personal responsibility and people who are consistently broke just don’t have it. I’m a 28-year-old woman, and I used to do EVERYTHING on the list on a pretty much daily basis. I led a sad life of credit card abuse and I was constantly seeking immediate gratification. I realize now that much of my financial irresponsibility was due first and foremost to me being irresponsible, but also to my parents (who have filed bankruptcy twice in their 30-year marriage) and my ex-husband whom encouraged me (and me him) to be this way. Now, I’m 90% out of credit card debt, and will be 100% by the end of the year! I’ve got a whole new perspective on money, budgeting, and saving…it’s really become a bit of a hobby for me. This is all due to my wonderful fiance who’s really shown me how to find happiness outside of material possessions, save (even on my low salary), and enjoy the present. Together he and I find a great balance of enjoying the present and planning for the future. I do think it’s important to stress that all saving and no play is not healthy. You could really die tomorrow! BUT!!!! You could also live to be 101! I also think it’s important to save or at least budget for tiny indulgences every few months…like I LOVE technology, so I budget, every year, to get a new phone…that means I don’t get pedicures every month like my girlfriends, but I ♥ my phone! One last thing, if people are judging you, why let it bother you? When I moved in, we threw away the couch he had and we decided we were going to buy a new one (cash of course). After spending a day shopping for one, we came home to a busted washing machine. Needless to say we bought a new washer and dryer instead. So, now we have no couch. A couple of our friends started laughing when they came over…”why don’t you guys have a couch…you can finance one and not make payments for a year” Geeze…you believe that?! I told her we don’t like being in debt and that it was really non of her business. It was awkward for a moment, but she then apologized and all was well. And I kind of like not having a couch! It’s always cuddle time on the floor with the puppy at our house! I have a customer who comes in without money and asks for a free soda and a free $1. to play sweepstakes games where I work. (Internet Cafe). The man is unemployed, broke, having marital problems, (wife wants to leave him), he shows up almost every day in a sort-of-disturbed and ragged demeanor. I do feel sorry for him because he is an educated man, good looking north-easterner. it is getting to the point where he is abusing his priviledges. I don’t want to kick someone when they are down on the floor, but he needs to find a job like all of us. What do I do? This article is infuriating to me. It puts all broke people in the same boat. I am one of those broke people, and yes, I have had some horribly bad things happen in my life that were completely out of my control. I want to hear someone tell me it was my fault when my father came to me when I was 19 years old, and told me the house was foreclosing, and he couldn’t take care of me anymore while I was in college. My fault that my one good car was rear-ended by some old guy who didn’t even brake and slammed into me causing the car to be a total loss, and my back to be the same. Yes, my insurance covered it for what it was worth, and cut me a check; however, I wasn’t able to get much of a car from it. I also want to hear that it was my fault when my engine blew on my second car because something flew off the truck in front of me, went under my car, popped up and hit my serpentine belt, causing it to split, fly off the car, and blow my engine. I want to hear you say it was my fault that my identity was stolen and a mortgage was added onto my name, which caused my credit score to drop into the 400s. Was it also my fault that I couldn’t keep a job because I wasn’t manipulative, a liar, a thief, or a door mat? Now, I finally work the greatest job on earth, but his location is closing down, and there is no spot for me. Let me also add that I have never caused a car accident, and I am a 26 year old female. Keeping in mind I have never lived on welfare, never gotten pregnant, never been married, never spent more than $8 on an article of clothing, am a master of budgeting, but somehow life always finds a way of throwing something at me! For example, this morning the kids in the neighborhood decided it would be cute to release the air out of two of my tires. Yes, I had to call into work, call someone to bring me an air pump, drive the car to the tire shop just in case it was a hole, and drive back to work. I lost probably $30 worth of pay from work after taxes. May not be much to you, but honey I can eat on $30 for a week! This list could go on all day, and doesn’t even touch what I’ve been through, but hey…I know it’s preparing me to become a stronger person. I know that the rich people who read this have NO idea what its like to be in my shoes, and somehow, they will always justify that their riches came from just doing life right, but you know…. Not everyone throws their money out the window. Ladies, if you’re reading this and you’re in the same boat…. Clean yourself up, marry a man you love with a stable income, go back to college while you can, and find a way to support yourself in this economy. That isn’t wrong. It’s smart. The proof that this article is true can be found in the stories of lottery winners, athletes, movie stars, etc. who hit it big (millionaires several times over) then years later have nothing to show for it. Especially in the case of lottery winners – these are generally poor people to begin with that already have ingrained in their character the above attitudes and behaviors. Winning the money doesn’t necessarily change their previously established patterns of behavior and many are broke within five to ten years. Really not that helpful, isn’t we don’t want to take responsibility at all. I’m broke mostly because I have to pay for other people to live and put myself second. And this seems to happen to a lot of us, got to make sire that rich person who doesn’t worry about anything has his pockets fat.